Learn more about Lexington, Kentucky using the City Guide below. Plan a trip, find local shopping centers, or just discover what makes Lexington, Kentucky so great! Lexington is the second largest city in Kentucky. Lexington has traditionally been dominated by the horse industry; in recent decades it has also been heavily influenced by the University of Kentucky, the flagship state university and largest employer in the city. The university sits immediately south of downtown Lexington, while the large open horse farms of old have gradually retreated from the city under the onslaught of suburbia. The horse industry has given Lexington a claim to fame, a scenic countryside, and Keeneland Racecourse. UK has given it a college town atmosphere and a richer and more diverse culture than one might expect from its size and location. The city is landlock and is not penetrated by any interstate, but it is nonetheless the urban mecca for all of eastern Kentucky. Blue Grass Airport (IATA: LEX, ICAO: KLEX), 4000 Terminal Drive; Phone: (859) 425-3114. A small regional airport that deposits passangers directly adjacent to Keeneland Race Course and a few miles from downtown. There is no passenger train service Lexington. The nearest would be Amtrak's Cardinal, with stations in Maysville, KY and Cincinnati, OH. Travellers usually access Lexington via one of the two major interstates that arc around the northern and western borders of the city. I-64 runs from east to west, most notably connecting Lexington with the largest city in Kentucky, Louisville, to the west. I-75 runs north-south, connecting Lexington with Cincinnati and Knoxville respectively. Neither interstate actually penetrates into the city, so motorists must take one of many possible exits that lead inbound. Several major streets radiate from downtown in a spiderweb pattern, and New Circle road runs in a complete circle around the city. Lexington is also served by the Martha Layne Collins Bluegrass Parkway, originating in Elizabethtown, KY.
A single Greyhound bus stop is found on New Circle Road on the north side of town, several miles from most attractions. Lexington has no rivers or large bodies of water, making it the second-largest landlocked city in the United States after Indianapolis. Lexington's only form of public transportation is Lextran, a bus service that provides access to many points in the city. Lextran is not very convenient for residents, much less tourists, so travelling by automobile is best if you plan to venture beyond downtown. Triangle Park, especially at night. Enjoy slipping off your shoes or sandals in the summertime and wandering in the step-like fountains that ring the backbone of this park. Get plenty of pictures of the illuminated fountains against the Lexington Convention Center. Cross the street and talk to the concierge at the Radisson Hotel to book a horse-drawn carriage tour of downtown. The Kentucky Theatre is a historic two-screen cinema with restored architecture and beautiful interior murals located downtown on Main Street. Its schedule tends to emphasize foreign, independent, and art films, plus occasional concerts and panel discussions at the premiers of controversial films. The theatre has an offbeat side as well, and raucous midnight showings of movies like the Rocky Horror Picture Show draw crowds of nearby University students every weekend. Despite the relative small size of this South-North straddling city, Lexington offers a surprisingly delightful palette of interesting activities. Whether you choose to explore some of the world-class and stunning horse farms ringing the city, hit up some of the surprisingly upscale shopping venues, take in a play at the Downtown Arts Center or the Lexington Opera House, tour the oldest university west of the Allegheny Mountains (Transylvania University), catch an insanely popular UK basketball game (Rupp Arena) or sample one of the myriad great restaurants that have sprung up all over town, you can be sure your experience here will not be a bland one. Tour the Kentucky Horse Park and horse farms clustered north and west of Lexington. The horse industry is Lexington's traditional and most famous trade, and many beautiful old farms are worth a look. The Park is basically tourist-oriented and offers a museum, nice walks, views of famous racehorses, and lots of bluegrass, but it is also the host of some very large horse events. Probably the most high profile is the Rolex, Horse Trials, Three Day Event which takes place every Spring. These horse trials are also used as Olympic selection trials so you can expect to see some world class horses and riders. The park is located five miles north of Lexington off Interstate 75, exit 120, and driving tours can be arranged with companies or can be self-guided if you have a car. Keeneland Race Course, Enjoy horse racing in a "days-gone-by" setting. Admission to the racetrack is only $3, but you are sure to put more money on a few horses of your choice. The only down side to Keeneland is that it hosts live races only a few months a year, with the Spring meet in April and Fall meet in October. The feature race of the Spring meet is the Toyota Bluegrass Stakes, a prep race for the Kentucky Derby. When its live races are not in session, you can still watch other races broadcast from around the world or attend events like the yearling horse sales, where some young stallions have commanded price tags in the millions. Buyers include local horse farms and bidders from Europe, Saudi Arabia, and Dubai. Keeneland lies on Versailles Road, one mile outside (west) of New Circle Road. Recent movies "Seabiscuit" and "Dreamer" have been filmed at Keeneland. The tradition at Keeneland is to 'dress-up' a bit, no jeans and t-shirts. Kentucky Wildcats Basketball games are intensely popular with locals and are held at Rupp Arena in the Lexington Convention Center downtown. Tickets are $22 at face value, but expect to pay illegal scalpers far more if you seek tickets to games against quality opponents. University of Kentucky is the largest university in Kentucky. Transylvania University is the oldest university west of the Allegheny mountains. There are three major shopping areas in Lexington. Fayette Mall at Nicholasville Road and New Circle was the first mall in Lexington and remains very popular. Recent construction has added a new wing to the mall itself and created a more open commercial campus that doubled the number of stores offered. Hamburg is a newer, more automobile-centered commercial area at the junction of Man o'War Boulevard and Interstate 75. An accompanying residential area sprang up with the mall just at the turn of the millennium. The area continues growing daily; expect plenty of traffic. Victorian Square is an upscale shopping area in the heart of downtown overlooking Triangle Park and connected to the adjacent motels and business complexes by raised pedways. Ritzy, artsy, and specialty shops abound. Victorian Square also connects via pedway to a second shopping center in the belly of the Lexington Convention Center. The city's college town atmosphere and affluent lifestyle contribute to this relatively small metropolitan area's great culinary offerings. Massive chain restaurants, typical in most American cities and towns, can be found here, as well as a great number of privately owned and operated establishments. You will find the greatest concentrations of restaurants around the Fayette Mall and Hamburg Pavilion shopping areas and also downtown and scattered about the rest of town. Charlie Brown's is a hip sandwich restaurant located at the end of Euclid Avenue just off the University of Kentucky campus. Patrons lounge in sofas and armchairs while chatting in the permanently low lighting. Bookshelves line all four walls and are crammed with old hardbacks; patrons may take any book they please as long as they replace it with another. Virtually all sandwiches are $6.50. Tolly Ho is a typical college town "greasy spoon" restaurant located just adjacent to UK's campus on South Limestone. Open 24 hours a day, "The Ho," as it is called by students, serves classic items like hamburgers, shakes, chili cheese fries, and the ever-popular cheddar tots. It gets extremely crowded when the bars close around 2:30 and the line stretches out into the front parking lot. Be sure to mention if it's your first time. The Chop House, Great steaks and chops in a warm, friendly environment. Joe Bologna is a moderately-priced Italian restaurant near downtown and the intersection of Vine St and Limestone Ave. It is located inside an old church, complete with stained-glass windows and raised pulpit (now a small bar). The square pizza at Joe B's is a tradition. Also, the bread stick is awesome - basically a small loaf of fresh bread accompanied by melted garlic butter. Ramsey's is a local favorite specializing in Southern fare. Its success has spawned many other branches in town, but try to go to the original, located in several connecting old houses at the intersection of Maxwell and Woodland Streets. All ingredients at the original are obtained from local farmers, and the branches try to do the same. Merrick Place boasts a classy restaurant nestled within the ritzy gated community of the same name. Reservations recommended. Malone's is a steakhouse chain that "imports" its prime beef straight from Chicago. There are two locations, one on Tates Creek Road and a newer location at Hamburg. The Hamburg location also has a sports bar and sushi restaurant. Dudley's, Maxwell Street (in Dudley Square). An old mansion that has been converted into a posh commercial complex. Dudley's occupies several rooms and serves American fare. Atomic Cafe, Third and Limestone. A laid-back restaurant and bar that offers a screened courtyard and reggae music on the weekends. Cheapside is a classy bar/restaurant frequented by many young professionals. The Dame, Main St. The most popular venue for live local music. McCarthy's seems to be the default bar for a wide range of people. Sprawled across three storefronts, it has a back patio, absolutely no cover charge, and a charismatic old doorman named Miami Steve who usually sports interesting headwear. Redmon's, Main Street. A snug country bar with live music every night of the week, often played by the owner himself. Very popular with the college crowd on Thursday nights. Saddle Ridge opened in 2006 and is not near the traditional downtown cluster of bars, but its spacious design, mechanical bull, and crowd-pleasing country/hip-hop music mix has quickly made it one of the most popular spots for twenty-somethings. Two Keys is the quintessential college bar, located straight across the street from UK's north campus and packed with Greek students during the school year. Microtel Inn Lexington, 2240 Buena Vista. Hyatt Regency Hotel, 401 West High Street. Large, downtown hotel, integrated into the Lexington Convention Center with its shops and Rupp Arena. Breezeways connect to the four other blocks which surround Triangle Park, including the ritzy Victorian Square. Radisson Plaza Hotel, 369 West Vine Street. Basically identical in appearance, location, and amenities, the Radisson boasts a popular and stylish bar but is less-directly connected to the Convention Center. Sheraton Suites Lexington Hotel, 2601 Richmond Road on New Circle. Offers a mix of gracious Southern hospitality and regional tradition. Louisville is 79 miles from Lexington. Cincinnati is 82 miles from Lexington. Travelling to or from Lexington, Kentucky? 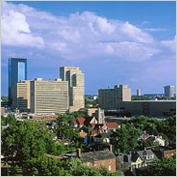 Find flight to or from Lexington, Kentucky with an Online Travel Agency. Get lodging information or make reservations with a Local Online Hotel. Plan ahead and reserve a car with a Local Car Rental Agency. Are you relocating to Lexington, Kentucky? Goods & Services in Lexington, Kentucky.